Come join me and James at ABC No Rio's benefit on May 3rd at Allegra LaViola on the Lower East Side. There will be wine, beer, food, a great silent art auction, and guest DJs including Anna Kustera, Doug McClemont, and Kembra Pfahler. James and I are on the benefit committee for this amazing collectively-run center for art and activism founded in 1980 -- initially as a squat where they took over an abandoned building to put on an art show called Real Estate. 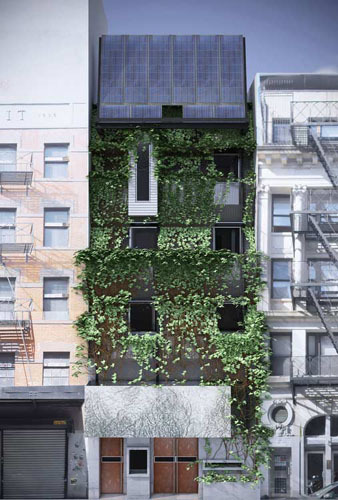 The old tenement building is going away to be replaced by a new building by architect Paul Castrucci based on sustainable design principles. Even if you can't make it to the benefit, any donation would be most appreciated! Our dear friend John Blee, who lived in DUMBO in the 1980s, is having a show this weekend in the gorgeous apartment (with incredible views) of Norma Jean Markus. 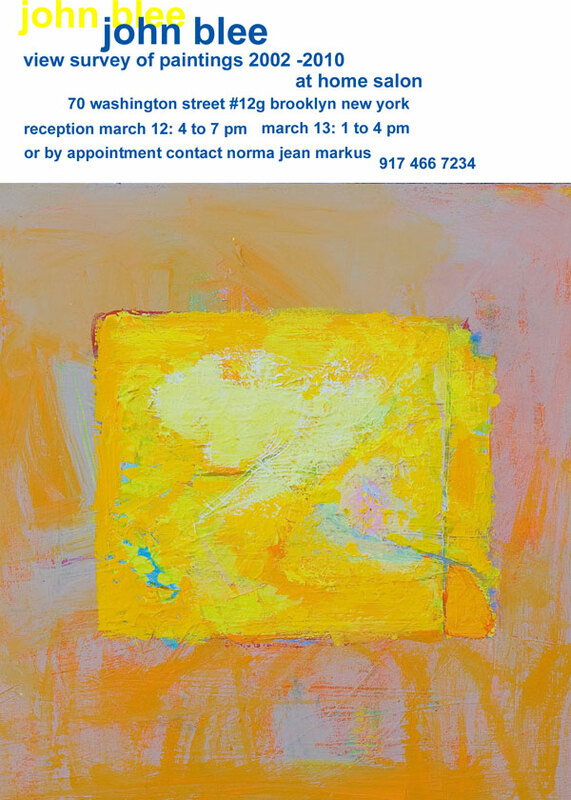 Reception: March 12, 4 - 7 pm and March 13, 1 - 4 pm. To visit by appointment: Contact Norma Jean Markus at 917.446.7234. Many visitors to our apartment have admired the two paintings we have of John's. The larger one was actually one of the first works of art in the apartment. This is your chance to see a range of John's work from the 1980s to present all at once. Related blog posts: jameswagner.com and Art Wrap. Below is an essay by David Matlock on John's work. from a technical standpoint and in terms of meaning? in shamanic frenzy. Success was hit or miss, all too dependent on possession. his meditative inscape. He owns the land that earlier painters had to burst into by force. who was shaped by the culture before he received his American inheritance. standpoint, the rendering of space is unique. There is nothing arbitrary or " atmospheric"
record of what he finds. John Blee studied with Helen Frankenthaler, Robert Moskowitz, and Robert Motherwell. Modern Art and the Los Angeles County Museum. He currently living in Washington DC. James has the full details on his blog, but I wanted to make sure my readers knew about this too. We'll be there on Sunday. Wear your free expression best and be part of the message. From an interview in the December 2010 Progressive. Q: You call your work not science fiction, but speculative fiction. What's the distinction you're drawing? Margaret Atwood: The distinction has to do with lineages. It has to do with ancestries, and what family books belong to because books do belong in families. The ancestor of science fiction is H. G. Wells with books like The Time Machine and The War of the Worlds. Those books involved things that are very unlikely to happen or are actually impossible, but they are ways of exploring possibilities and human nature and the way people react to certain things. And if you go to another planet, you get to build the whole society and you can draw blueprints and have fun with talking vegetation and other such things. The lineage of speculative fiction traces back to Jules Verne, who wrote about things that he could see coming to pass that were possible on the Earth--this wasn't about outer space or space invasions--but things that we could actually do. Over breakfast I mentioned these two news items today, and James suggested the connection. 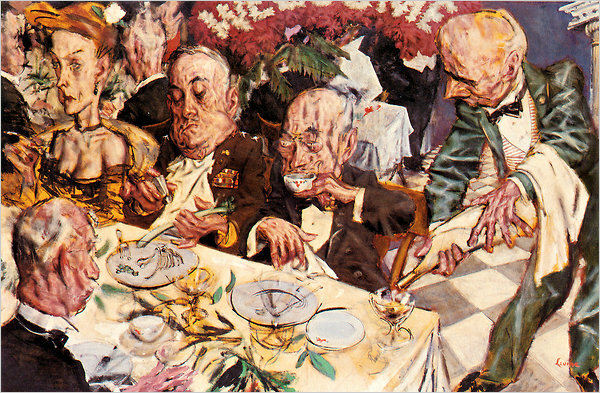 It shows an armchair general being honored at an expensive restaurant, a wad of food in one cheek. On his right sits a bored socialite. Two decrepit businessmen in tuxedos make up the rest of the party. The central figure, Mr. Levine said, was "the big slob who is vice president of the Second National Bank and the president of the Chamber of Commerce, only now he's been in the Army." When "Welcome Home" was included in an exhibition of American culture in Moscow in 1959, the chairman of the House Committee on Un-American Activities mounted a campaign to have it removed. President Dwight D. Eisenhower said, "It looks more like a lampoon than art, as far as I am concerned," but refused to intervene. The uproar made Mr. Levine a star. He later told an interviewer, "You get denounced by the president of the United States, you've hit the top." Retired Gen. Stanley McChrystal, who was fired by President Barack Obama after making insulting comments about top administration officials, was named Tuesday to the JetBlue Airways Corp. board of directors. Bohemias. Alternative subcultures. They were a crucial aspect of industrial civilization in the previous two centuries. They were where industrial civilization went to dream. A sort of unconscious R&D, exploring alternate societal strategies. Each one would have a dress code, characteristic forms of artistic expression, a substance or substances of choice, and a set of sexual values at odds with those of the culture at large. And they did, frequently, have locales with which they became associated. But they became extinct. We started picking them before they could ripen. A certain crucial growing period was lost, as marketing evolved and the mechanisms of recommodification became quicker, more rapacious. Authentic subcultures required backwaters, and time, and there are no more backwaters. 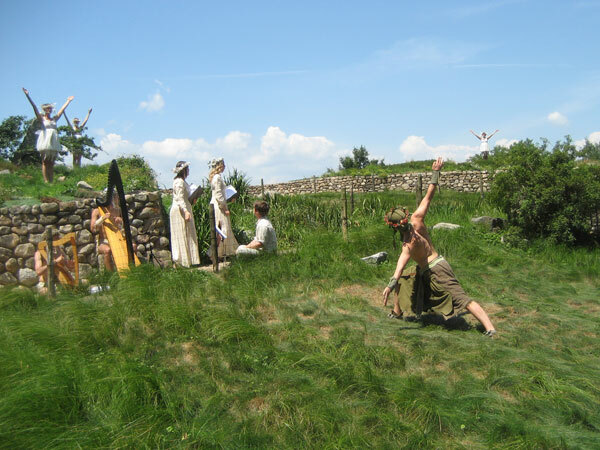 James and I went to the Irish Hunger Memorial today to see an excerpt of The Voyage of Garbhglas by Christopher Williams courtesy of the Lower Manhattan Cultural Council. The video above is a short segment of the 30-minute performance. I've also added one photo, and you can see more in my flickr set. Never miss a chance to see this choreographer's work. His 3-hour work The Golden Legend at Dance Theater Workshop was funny, moving, and brilliant. 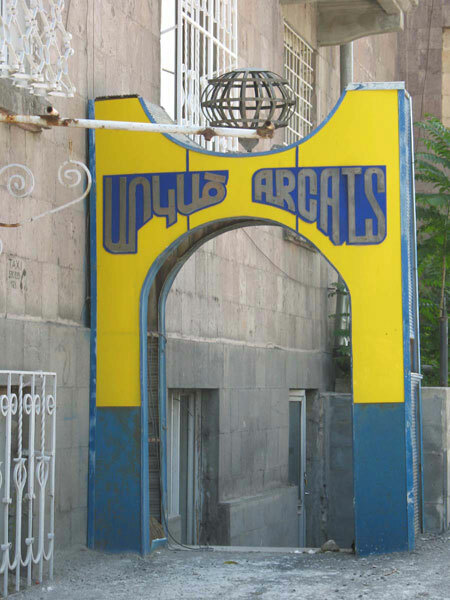 Our friend Susan C. Dessel recently finished a residency at the ACSL (Art and Culture Studies Laboratory) in Yerevan, Armenia. While there she spotted this arch which made her think of our site ArtCat. Visit her blog for her adventures in Armenia.